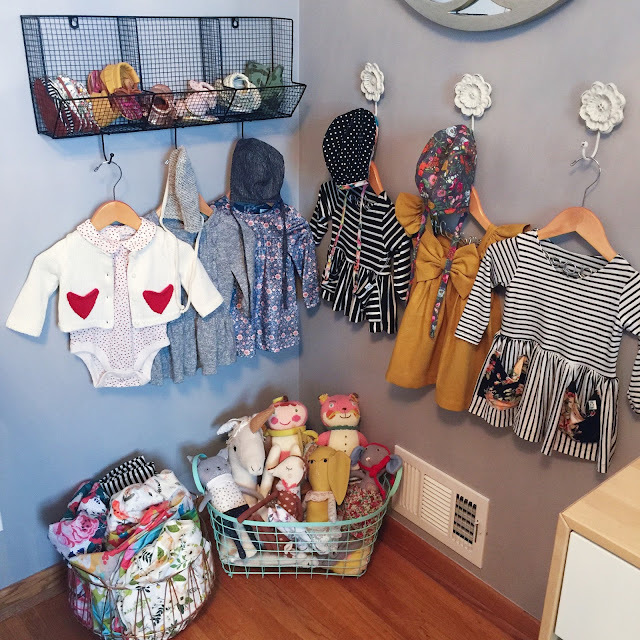 One of my favorite ways to decorate the girls' rooms is with clothing & accessories...special pieces I already have on hand that allow me to personalize a space to each of my little girls. Instead of storing them folded in drawers or hanging in closets, I put clothing on display using decorative hooks and functional wall decor. Dresses of course are perfect for hanging up and I love them paired with bonnets on hooks. Both of the girls have lots of bonnets on display in their rooms, which I love because they often grow out of them fast. After a dress is too small, I love hanging it up as a reminder of the season they wore it in and all the memories that were made. 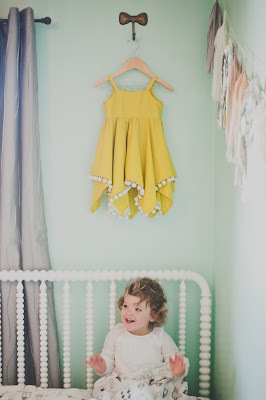 Olivia wore the sweetest pom pom dress for my maternity photos last Summer and even though it no longer fits her, I have it hanging in her room on a "big sister" hanger. It's so special to me to see it often and remember the day we took those photos and it adds a fun and unexpected pop of color to her room. This 3 piece wire basket with hooks (above) is one of my all-time favorite ways to display clothing and accessories in a nursery. You can fill the baskets with shoes, headbands, or any other accessories you have. I also love this vintage gold arrow with hooks, which is currently sitting in a box in my closet waiting to be hung somewhere. I've just about used up every square inch of wall space in each of their rooms but I know I'll have it when I need it. Another place to find fun wall hooks is The Land of Nod. These little bow hooks are spread throughout both Olivia and Penelope's rooms and are perfect for everything under the sun! And this nightingale wall hook is darling too. And because I'm always dreaming of what I can do next, I recently stumbled upon these gallery wall art rails and I love the idea of hanging up their artwork in a playroom or even their own room! Olivia loves painting at school and we always put her pictures on the front of our fridge. Every time she sees them she gets the biggest smile across her face and wants to point them out to everyone. The art rails look like they would be the perfect way to display it! For hangers, my favorite come from Handcrafted Affairs. Beth is one of my dear friends and makes the sweetest custom hangers. A few of our favorites are ones that say "big sister," "little sister," "penelope bae," "poppy," "olivia bea," "#ootd", "dress up," and more. If I'm going to hang up dresses, it's so special to have them on personalized hangers.